WILLEMSTAD – The Teen Parade drew yesterday a dancing crowd through the streets. It was colorful and cheerful. The atmosphere was good. 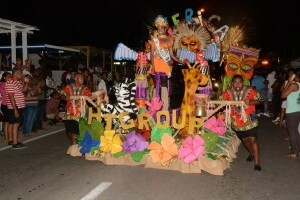 The carnival parade of teenagers from different high schools on the island was very creative with beautiful costumes. It was both for the participants of the parade and the many spectators a big party. Tomorrow morning at 11:00 starts the Gran Marcha, the big parade in Sta. Maria and will march all the way to Otrabanda.